A vacation home to fit the top of a steep mountain ridge. It must take full advantage of a fantastic view of the mountain forest with nothing manmade in sight, all protected land. 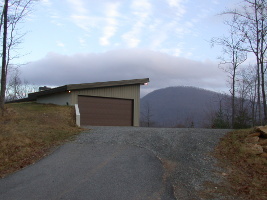 The clients were looking for ideas that would be different from most mountain homes. They described wanting something modern, like an industrial loft, only warmer. The house must be hidden from the street. These requirements might seem difficult, but they turned into one of the best homes I have planned. The first step: Excited to have a project that was unique, arrangements were made for me to visit the property. The view was even better than they described. But I broke out in a huge smile when I took some compass readings. I asked them if they had heard of passive solar homes. No. Then I asked if they really wanted all the glass to face the view. They said, Of course. I explained that the view was due south, and with glass facing this direction, it would also face the winter sun, making it an energy efficient passive solar home. They were intrigued. I was thoroughly excited to be able to design my very first passive solar home. Read on to see how this developed into a most efficient and beautiful home. Instead of placing the home along the top of the ridge, I suggested moving it toward the south about 20 feet, a little down on the south facing slope, allowing us to use the ridge and trees to hide the house from the street. We would bury the north facing wall almost to the roof. This would allow much more of the basement level to have windows facing the view, and also the warm winter sun. The only negative was the extra cost of engineering and building a 17 foot tall wall with 14 feet of ground against it. But the clients loved it. To increase the view I planned for glass to wrap around the corners of the great room. 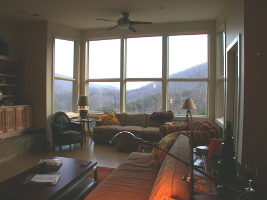 I also discouraged them from placing the deck between the great room and the view. To keep it clear, I suggested the deck be placed beside the great room. The deck has the same view, but the view from the great room is much more great! 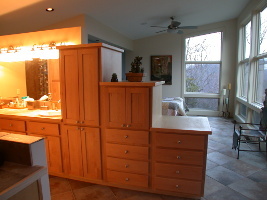 The master suite has the open loft feel they wanted with just a cabinet separating the bedroom from the bath. 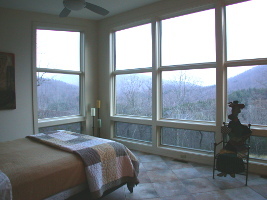 By wrapping glass around the south and east sides, this room has a dramatic view of the mountain forest. I discerned that the clients wanted to feel very private, so I planned the garage to be the first thing guests would see, followed by the deck, the kitchen, the dining, the great room, and last would be the master suite on the private end of the house. To keep costs down we planned for the guestrooms to be in the basement, each with glass doors facing the view. The shape of the house was kept long and narrow for several reasons. This shape fits better on a steep slope. It cuts down on excavation costs. Fewer trees need to be cut down. There is less need for retaining walls. More rooms face the view and more glass faces the winter sun. 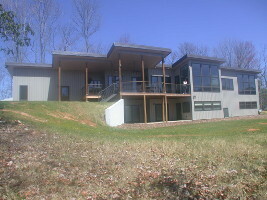 The clients loved the idea of having an energy efficient vacation home. They had an engineer run heating and cooling calculations on this plan. Of course I was eager to see the results. They taught me something very interesting. While the south facing glass saved a lot of energy, the buried walls on the north side saved even more. 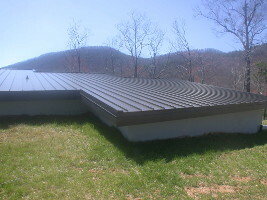 In Blairsville the ground stays about 55 degrees all year. Imagine how that would keep the house warm in the winter, and cool in the summer. It would be like heating the house in Miami and cooling it in Alaska. This is a lesson I have used in many other design projects. So, how did the house perform? While it was under construction, it never got cold inside, even in the winter without heat. The workers were amazed by this. The clients tell me that sometimes in the winter they need to open windows to let some of the heat out. Imagine, fresh air in the winter! And the clients love their vacation home, so much that a friend hired me to plan her own home next door.